Buy a 5-Pack & Save $2.50! 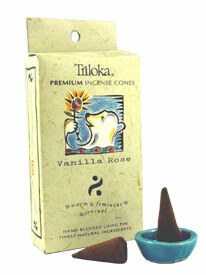 Triloka Herbal Incense Cones are handmade according to the ancient tradition of India according to traditional formulas. Herbs, resins and essential oils are blended in a base of pure sandalwood powder. Each cone is hand pressed and sun dried. No short cuts in quality! Use Triloka cones as a natural air freshner, mood enhancer or for meditation.